The finish-line buzz at Saturday’s Frosty Bottom consisted of some of the usual conversation you hear from bikers when they finish a race. There was talk of killer hills, mechanical complications and legs flooded with lactic acid. 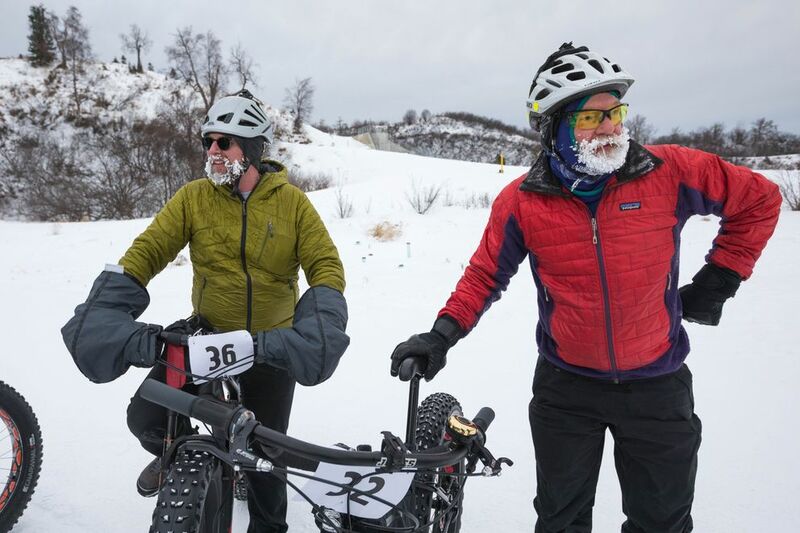 But an exchange between winner Jason Lamoreaux and third-place David Arteaga can only happen after a long race on a winter day when the temperature never reached double figures. Add chattering teeth to the offbeat chatter, and you have the Frosty Bottom in a nutshell. 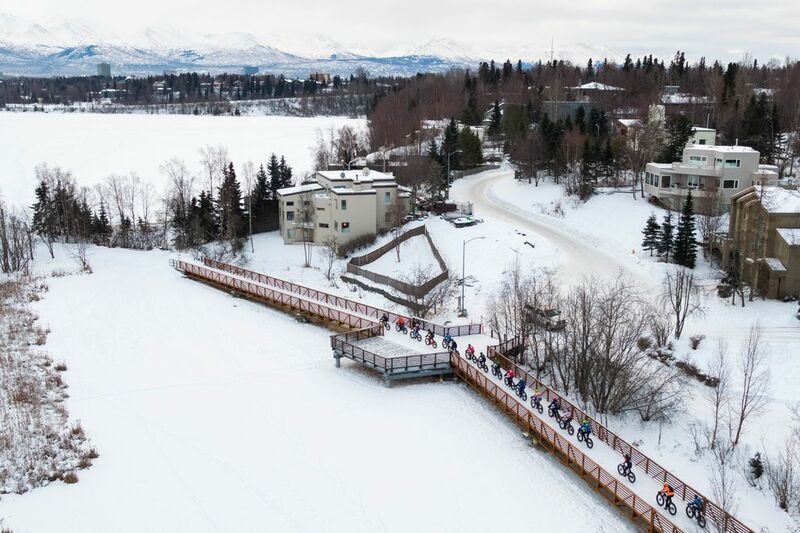 The 13th annual race across Anchorage started Saturday morning at Kincaid Park, where the temperature was 5 degrees (minus-11 with the wind chill). A field of 168 bikers completed the race, with 107 going 25 miles to Goose Lake and back and another 61 going 43 miles from Kincaid to Goose Lake to Far North Bicentennial Park and then back to Kincaid. 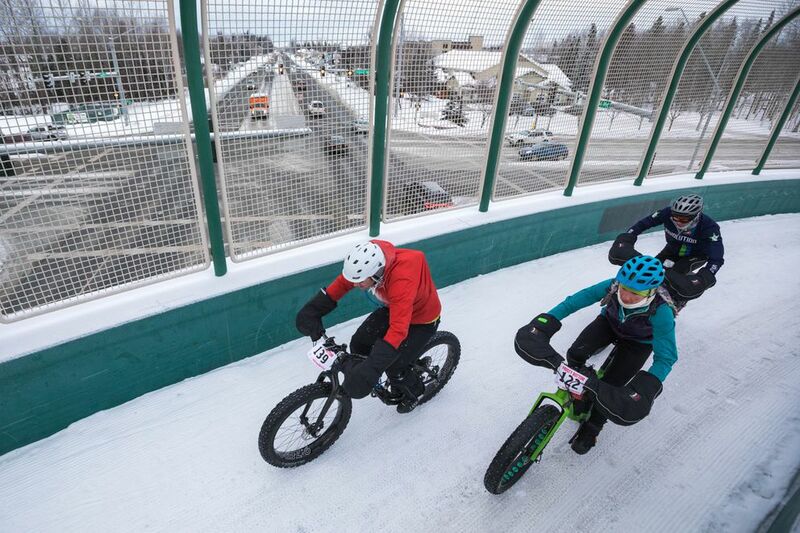 Lamoreaux, a fixture in Alaska’s bike community, won his first Frosty Bottom title with a mad sprint up the half-mile-long hill leading from the Coastal Trail to the finish line. Not this time. Lamoreaux made the trip in 2 hours, 48 minutes, 40 seconds. Eric Flanders was 26 seconds behind in second place, and Arteaga was 36 seconds behind in third place. Thirty-one-year-old Megan Chelf was the women’s winner in 3:13:21, which made her 16th overall. Tazlina Mannix was second among women in 3:16:49 and Laura Fox was third in 3:33:02. In the 25-mile race, victories went to 35-year-old Brent Lowen (1:43:55) and 60-year-old Sheryl Loan (1:56:39). Loan, who was more than three minutes ahead of women’s runnerup Katie Bell, placed 13th overall. The top four men raced in a pack until Lamoreaux attacked the final hill to see if he could pull away from the crowd. “That hill is legendary. That’s where this race is won,” Flanders said. Flanders said Lamoreaux managed to open a sizable gap quickly, but he tried following all the same. But Lamoreaux didn’t fade, and he mixed in a little mind game for insurance. “I stood up on my bike a couple times just to make it look like I was pushing harder,” he said. 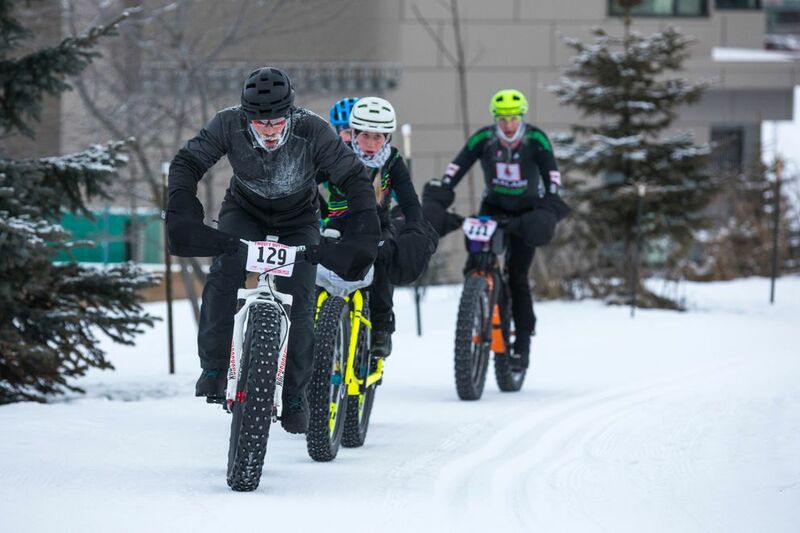 Lamoreaux finished with ice caked on the wheels of his fat-tire bike and on his pants. He said he encountered two patches of overflow, and on the second one the front of his bike sank three or four inches through the slush and got stuck. He had to get off his bike to drag it out of the flooded area. Lamoreaux turned down his wife’s offer of a hot drink at the finish line, saying he was plenty warm. Sixty-year-old Randy Romenesko looked plenty cold when he finished the 25-mile race. His beard and mustache were made thick by ice and frost, but he professed not to be cold. Saturday was Romenesko’s first bike race in 20 years – he said he decided to enter on Wednesday – and he was impressed by the turnout, the camaraderie and some of the speed on display. 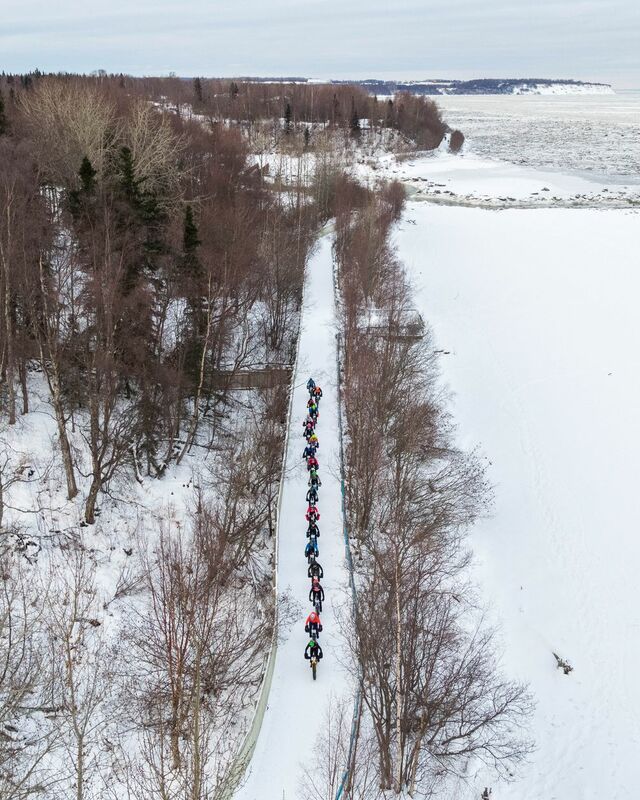 Ruben Alvarez, 52, felt the cold more than Romenesko did in the 25-mile race, maybe because he moved to Anchorage from Colombia and not Nome. “This is the coldest I have ever been biking,” he said. 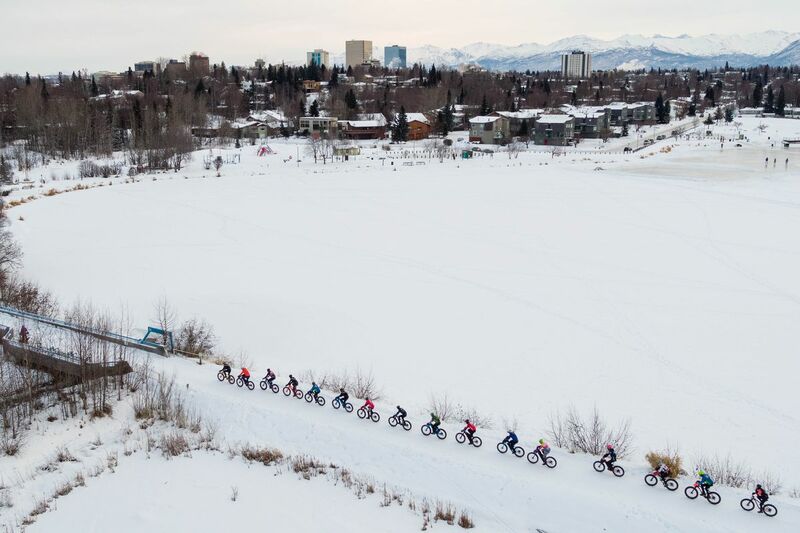 He said the most challenging part of the race came at Westchester Lagoon on his way back to Kincaid, where he stopped to change shoes, going from a heavier, warmer pair to a lighter, less insulated pair as part of his strategy to pick up speed on the return trip. “It was hard, because I was getting cramps,” said Alvarez, a BP worker who came to Alaska eight years ago. When Kaitlin Mattos finished the 25-mile race, her eyelashes were painted with frost, giving her the look of an ice queen from a fairy tale. 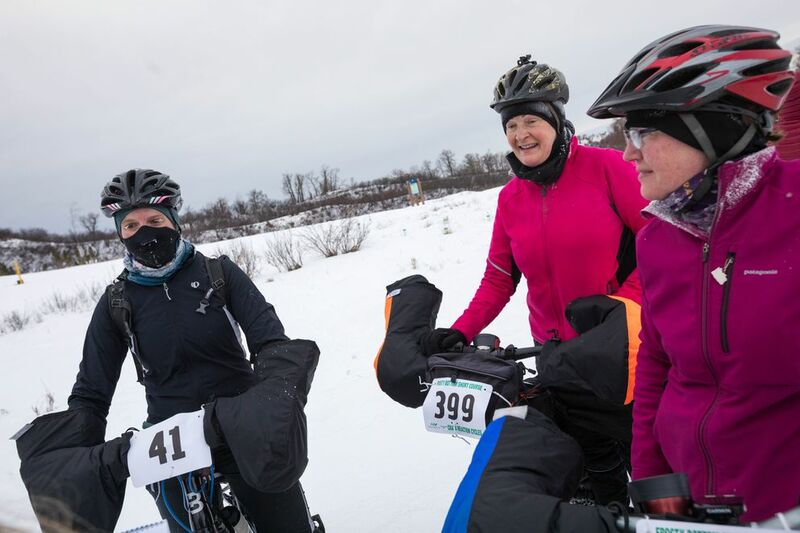 Mattos did the race with Gloria Menzel and Bonnie Wanat, all members of the Alaska Dirt Divas mountain biking club. They are used to biking year-round, so they came prepared. “I wore my skirt because my behind always gets cold,” Menzel said. Wanat, who managed to keep her eyeglasses from fogging up or frosting over during the race, said the tops of her legs were cold but she was otherwise comfortable during her race, which lasted a little longer than 2.5 hours. Mattos packed her pogies – giant gloves that attach to handlebars – with extra gloves, hand warmers and food. 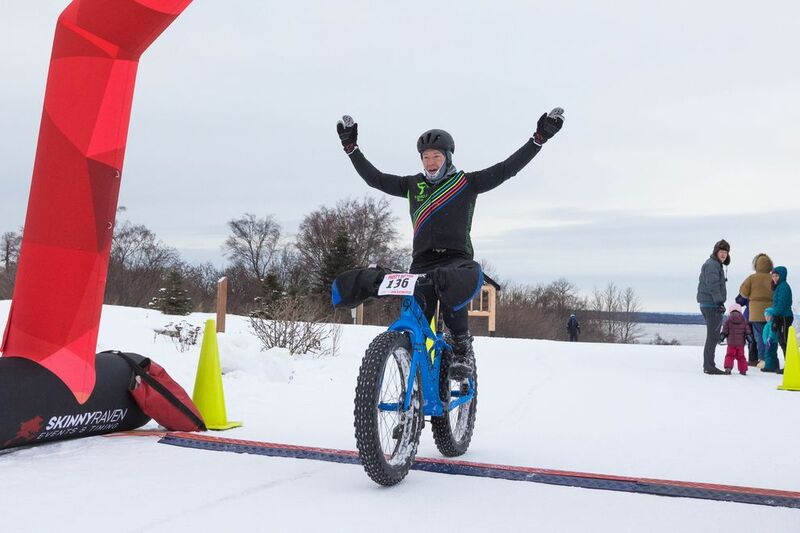 “My toes are frozen,” she said, and so was something else -- something you might expect to feel the chill at a winter bike race called the Frosty Bottom. “My bottom’s pretty frosty,” she said.